Are we all hoarders deep down? What does 10 years of continuous and constant and consistent consumption look like? Look around your apartment or your house. That's what it looks like. Our spaces are bursting at the seams. Our garages can't even fit our cars. Our closets are too full. Our attics and basement are full of unused things. This is hoarding. It might not be as extreme as the examples we see on the TV show, but we are still holding on to things that no longer serve us. I graduated college at 22. I lived with my parents for two years post undergrad to complete my masters. Since I was 18 I’ve worked. I did not have the traditional allowance that most American kids have. My parents were immigrants from the Philippines and had their own rules and beliefs about money, an allowance was not something they believed in. We did dishes (by hand even though we had a dishwasher), cleaned the bathroom every Saturday, dusted the living room, baby sat our youngest sister without any expectation of getting “paid”. We didn't grow up poor or rich. At 18, having money meant freedom. I could now buy whatever I wanted without needing to ask my parents for money and ultimately getting rejected. So since 18, I’ve spent almost every pretty penny I earned on stuff. If it could be found at the mall, I bought it. Since moving out of my parents house, I’ve been hauling around stuff to 3 different apartments. I paid people to move my stuff from place to place. My husband and I are in the process of moving out after 5 years in our apartment and this is all of the stuff I’m finding that I’ve been hoarding. Now, I do want to also qualify that over the past year, we have decluttered, minimized, and thought a lot about our purchases, yet we are still finding lots of things to donate, sell or throw away. So even though I am working my way through minimalism, today, I feel like a hoarder. I'm looking at things wanting to keep them because they will be useful someday. The probably is that someday never comes so we end up with all of these things that take time to maintain. 1. Clothing. All types, brands, eras, sizes. I guess my fantasy self is model thin, a rockstar, a princess, a snowboarder because I found all of these clothes somewhere in my closet and drawers. I know we all go through phases, we eventually grow out of them, yet we still hold on to these things. 2. Pens. For the love of anything holy, why do I have so many pens and why do I keep finding them everywhere. Of course they are in our junk drawer, but I also found a mug full on a bookshelf, on top of a dresser, in a box with other office supplies. Some of these pens of course were bought, some stolen from work, some from banks or events, some were even from college and from my very first job over ten years ago. You know where pens don’t exist, in my purse or next to my notebook where I need them to be. 3. Cards. Not sure why I have kept all of our wedding cards, birthday cards, and every other card under the sun. I use to love giving cards, but you know what, I didn’t expect people to keep the cards I give them so not sure why I did too. 4. Books. Lots of them. Some read, many unread. I’ve significantly reduced books and am glad to use the library to find what I need. 5. Pictures. I went to college when film was still around. My roommate always had a disposable camera with her to capture the moments. When I transitioned to a DSLR, I would always print out the pictures. For some reason, even though I have most of my pictures in electronic format in the cloud, I can’t seem to throw out these copies. There’s a part of me that feels bad throwing a memory even though I’m not really. 6. Sheets and Towels. My husband and I live in a one bedroom apartment, yet for some reason, we have enough sheets and towels to run a small hotel. When we moved in together, we combined our linens together. When we got married, people gave us new sheets and towels, but to this day, we have yet to reduce. 7. Company Branded Gear. I didn’t realize I had so much of these until I started really looking at my stuff. My average time working for a company has been three years. It appears that during that time, one can accumulate almost every imaginable thing a company hands out to their employees as a gift. I worked in ad tech for a good portion of my working life and ad tech loves gadgets and company branded gear. Some things I found: branded weekender bag (actually very nice), branded sweatshirts (very popular), branded blankets (I have two from two separate companies), branded hats, branded notebooks, branded outdoor gear (the expensive kind), branded plastic water bottles, and so much more. I wonder if this really helps morale in the long-run. I doubt it. 8. Travel and Sample Sizes. I’m still finding these everywhere even though I’ve consciously stop taking these, but years before, whenever I went on each trip, I would always do a Target run and buy every imaginable travel size item just in case. Did I need all of them? No, but their miniature nature makes them too cute to pass up. 9. Cables and chords. I guess I feared not having an Ethernet cable or a USB cable because I have a box full of these. I wish there was a way to select what cables you need when you buy a new electronic device. I'm sure that would save so much money and resources. 10. Scraps. Of everything for a future project that I will never get to. This includes paper, cloth, gift wrapping, etc. We've watched the show "Hoarders" and many of us wonder how people can live like that. 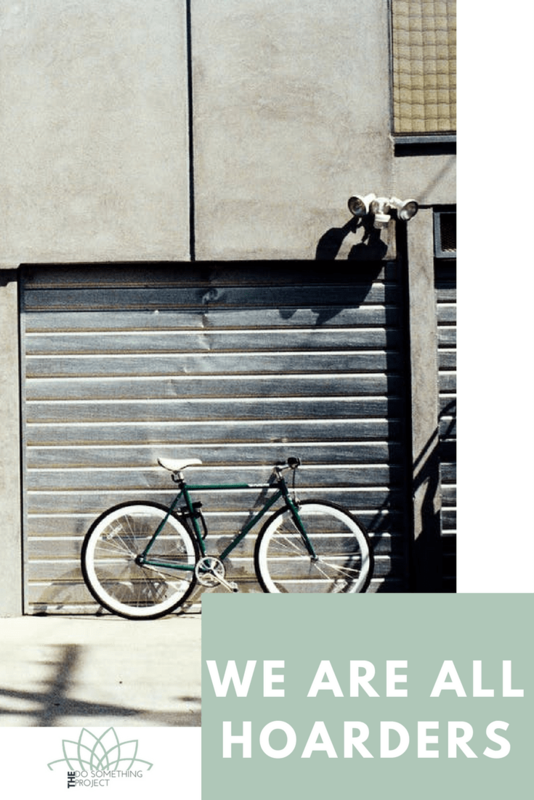 The truth is, many of us are already living as hoarders, it's just our stuff is placed neatly in organization bins, arranged in designer closets or packed in self-storage units. The out of sight, out of mind mentality is alive and well when it comes to our stuff. So even though we watch "Hoarders" with a bit of disdain and pat ourselves for not being like that, we, unfortunately are all hoarders. Of course, it doesn't have to be this way. We can break from the chain.